I never get tired of making my own simple accessories, mainly because I can whip up something to go with anything, without spending a lot of time or money to do so. Today's projects fit the bill for ease and they also show off the hexagon love! We'll start with a necklace, and at the end of this post I'll show you the headband version that I made. It's inspired by another quick necklace that I made a while back. 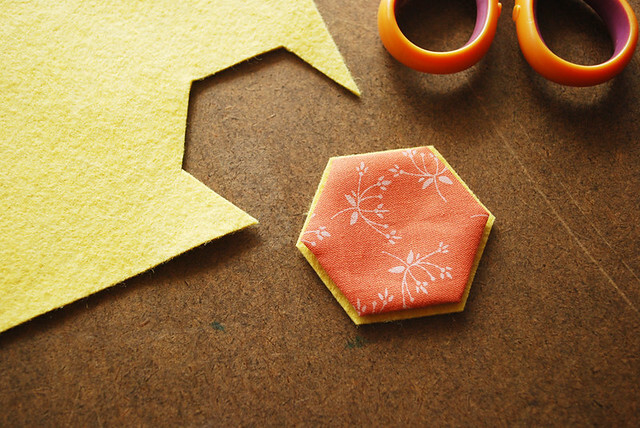 Place your hexagon onto the felt and cut around the shape, leaving a small amount of felt showing. 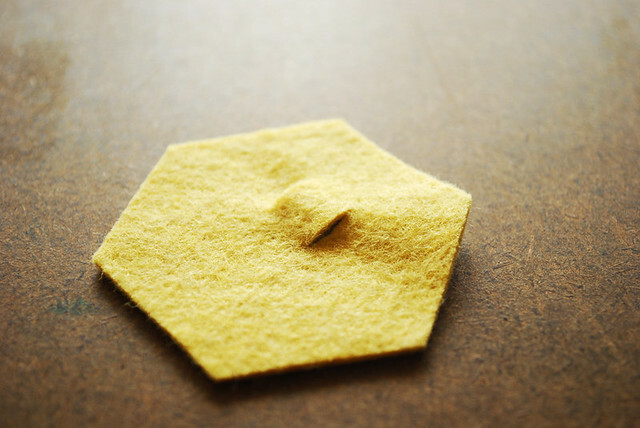 Fold the top of the felt down and cut two small, parallel slits in the hexagon. 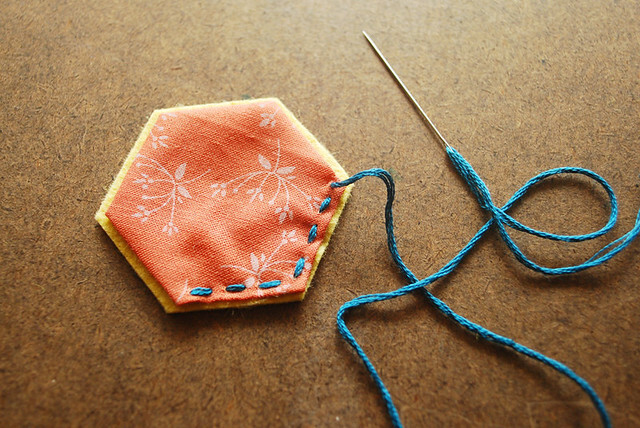 Stitch the hexagon onto the felt backing using running stitch. 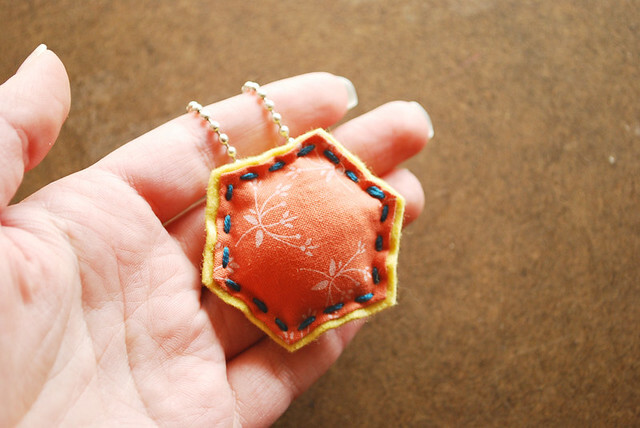 To give your hexagon charm a bit of dimension, add a tiny bit of stuffing between the layers before you finish sewing them together. The stuffing is optional. 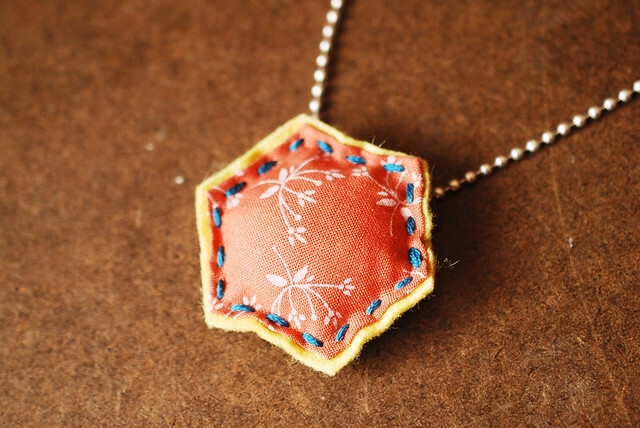 This hexie will look just as cute if it's flat. 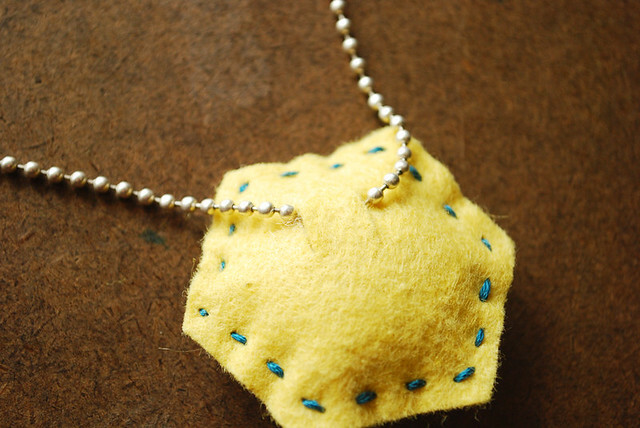 Turn the hexagon over and slide the necklace through the slits in the felt. Your necklace is ready to wear! Make them to go with different outfits or give them as gifts to your quilting friends. These would also be a great place to incorporate one of the hexagon patterns I made! 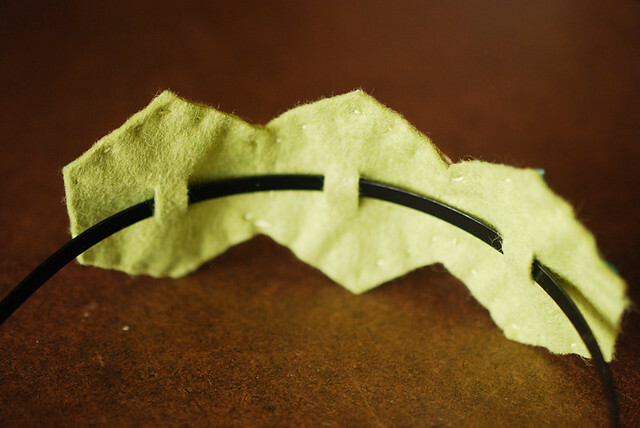 You can use this same basic method to create a super sweet headband! I love that only the hexagons really stand out, and they look like they are clinging to my head sort of like a little fascinator. Start by joining the three hexagons together. (A brief how-to can be found here.) 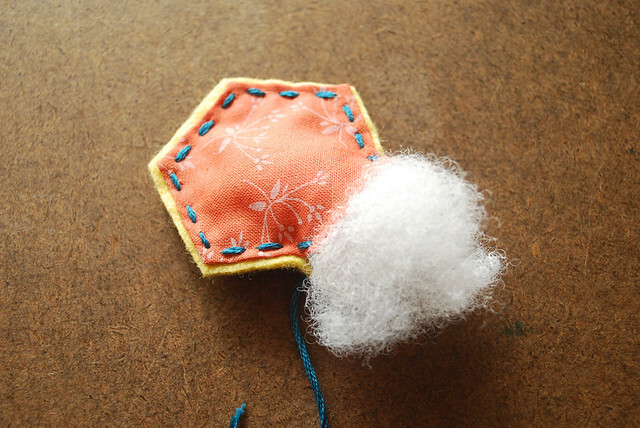 Place the joined hexies on the felt and cut around the shape. 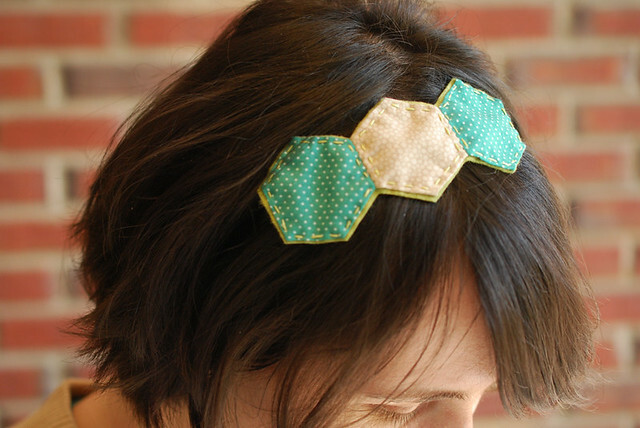 In each hexagon area of the felt, cut two parallel slits, forming three tabs for the headband. 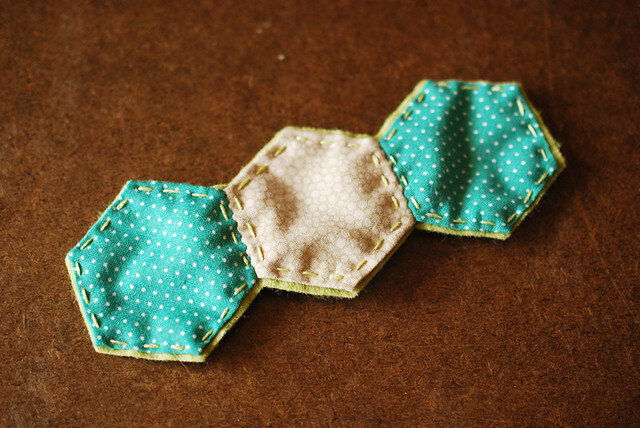 Stitch the hexagons onto the felt with running stitch, then slide the headband through the back. I wore mine so that the hexagons are off to one side a bit, which is kinda cute. But you can slide it to wherever you want it. I love this one so much that I might try a few more variations. Maybe only one hexie? Or possibly five or six? Also...this is the first that I'm showing off a peek at my new hair. I recently chopped off almost 12 inches! Thankfully, headbands still work with shorter hair! This is the greatest thing ever!! I know what ill be doing this weekend! You are so talented! 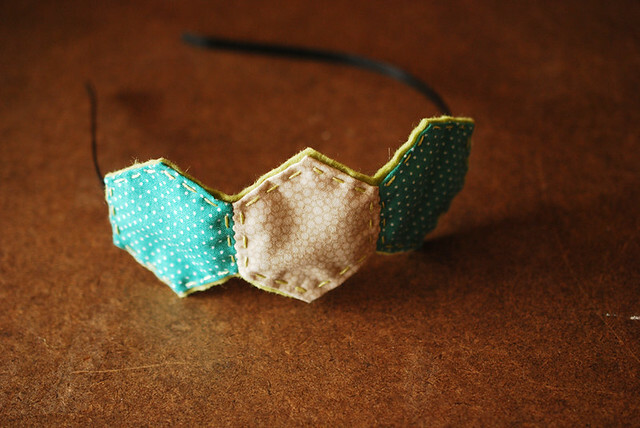 I love this, adorable :) I might give it a go, I have so many scraps that need projects to go to! So nice! I think that headband is just fine for a little girl I know! I love the headband. My granddaughters would look adorable in those. You make the cutest things. 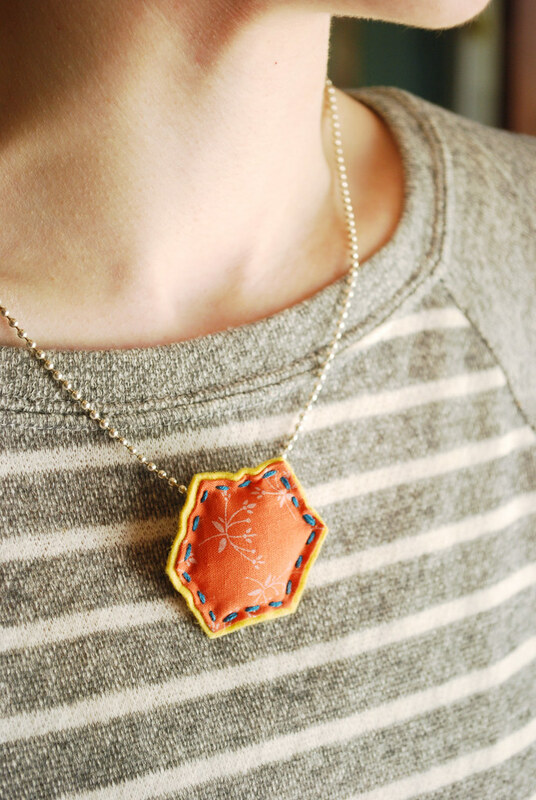 So clever, and combining two of my favorite items fabric and jewelry! Love it. Thanks for the headband idea! I have four daughters and I cannot buy enough headbands to keep up! This will be great for my "no flowers please" daughter. So cute! I've been itching to do some hexagons, but I don't have the time to devote myself to it properly. This project is perfect for me to do right now! This is so cute! I like it. What a lovely idea! very simple and so nice :) Thank you! it is so pretty. adorable..
thanks for the project idea. So adorable, I love the necklace. This is cute and so easy to make. I'm going to adapt this and stick a safety pin through the slits in the felt to make a pin instead of a necklace. I'm going to teach people to make them at our upcoming local Makers Faire in May. Thanks for the idea! Lovely head band,,, did you save your cut hair so that the hair could be made into wig? I did! I donated it to Locks of Love.